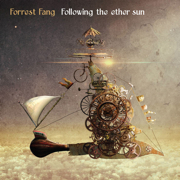 Few musicians reach as high as Forrest Fang. His charismatic musical vision is arrived at through the accumulation of experiences and encounters with an intriguing range of acoustic and electronic instruments - an exotic sonic palette making his works as stimulating to the ear as they are to the mind. In a great structure of thought he conjures an idealized world of sound - where Spacemusic, World Music, New Age and the Avant-Garde all share a common spirit, and sound connects everything. 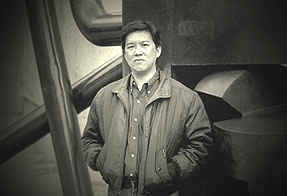 Forrest Fang plays the song of himself, as his numerous musical works have always seemed a pipeline into his inner world. Producing a music for our world, but not entirely of it, his music unfurls like a gorgeous dream. STAR'S END: I'm not sure why, but your 1989 release The Wolf at the Ruins still sits with me in very high regard. This may be merely because it was my first introduction to you... but, does this work hold any special place in your heart as well? 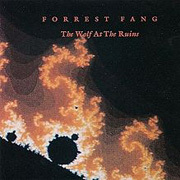 Forrest Fang: Yes, "Wolf" remains a special album to me. It was my first extended work and I think it fairly represents the varied influences (progressive music, minimalism, ethnic music) that remain a part of my music today. STAR'S END: What conditions drove/caused you to record and release your first album? Forrest: The pieces from that album were recorded while I was studying electronic music and composition in college, but I didn't have an album in mind when I recorded them. I was inspired to release them as an album after seeing two friends who worked in a local record store release an album of experimental guitar improvs under the name, "The Janitors." STAR'S END: Have you ever had to describe your music to someone who has had no previous contact with contemporary or innovative instrumental music? If so, then how did you do it? Forrest: I have always had difficulty describing my music to casual music listeners. I would describe my music as an electronic/acoustic hybrid with progressive, ethnic, folk and classical influences. Koyaanisqatsi: One of the best marriages of sound and visuals I have ever seen. Philip Glass' soundtrack was one my early minimalist favorites. Shadow of a Doubt: Early Hitchcock film that was both enjoyable and creepy in portrayal of a sociopathic uncle. The Squid and the Whale: A film that rides the fine line between humor and sadness. Great performances from Jeff Daniels, Laura Linney and a young Jesse Eisenberg. 2001: A Space Odyssey: Had to include this one for strange effect it had on me as a kid, especially Bowman's battle with HAL and the closing scene. It led me backwards to the book. The Up Series: A series of films made every seven years that track the lives of a group of British children from varied cultural and economic backgrounds, starting at the age of seven. Very moving. Emerson, Lake & Palmer, Works II Tour (1978) - I stood in line for almost half a day to get a decent seat to see them, and I wasn't disappointed. Their rendition of "Karn Evil 9" was great and I, of course, enjoyed Emerson's Rondo encore with the organ falling on top of him. Bill Bruford (1979) - Great to see Bruford perform his prog fusion with Jeff Berlin, Dave Stewart and the Unknown John Clark doing a very credible Allan Holdsworth imitation. Premiata Forneria Marconi (1977) - Enjoyed hearing this Italian progressive band during its jazz fusion phase. Itzhak Perlman (1972) - Thanks to my parents, I heard a young Perlman perform Paganini's 24 Caprices at the Hollywood Bowl. The DBs (1988) - Saw their last performance (without Chris Stamey) before they went into retirement for a number of years. Peter Holsapple's voice was ragged but right, and the band was in a groove. They closed with cue card credits, a la Dylan. STAR'S END: What's it like where you live? 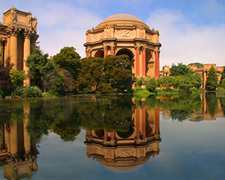 Forrest: I've enjoyed living in the Bay Area over the past three decades. It's gone through its economic ups and downs, but the constant has been the liveliness of its arts scene. Forrest: Whoa, that's a bit of a loaded question. The word has a lot of cultural baggage. In strictly musical terms, I think that a "masculine" sound could complement a softer, more "feminine" sound in the way that an allegro movement in a symphony precedes a slower adagio. 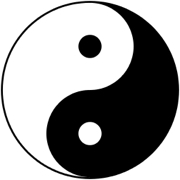 Yin meets yang. STAR'S END: Explain how your 2016 release The Sleepwalker's Ocean became a two CD set? 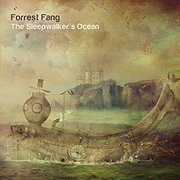 Forrest: The long-form piece on the second CD (An Alternate Ocean) was almost an accident. I was experimenting with extreme processing of certain elements from the album and found that they worked well as a continuous piece. STAR'S END: In the late 1970s, when you were still a teenager, your parents bought you a synthesizer. Have I got this right (my parents were not so encouraging)? I imagine this was a turning point for you? or one of many, in your journey into music... Please tell us about your parent's attitude toward your creative endeavors. Forrest: My parents were very supportive of my interest in music to a point. 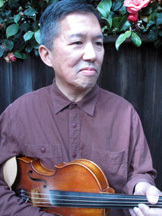 My father played violin, so he was very happy I had chosen violin as my first instrument. 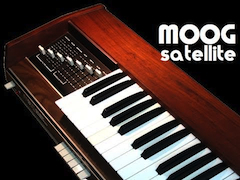 They bought a Moog Satellite for me as a high school graduation gift, but they knew and I knew I would have to support myself some other way. It was a turning point in that I decided I had to study electronic music and composition first before creating anything I would want to share with anyone. I think they realized my commitment to making music was for real when I came out with my third album, Migration at a time when it was very expensive to release record albums. STAR'S END: I've heard from many musicians about the "flow" state they sometimes achieve during live performances. As I suspect that you do not play out live, have you a means to experience "flow"? Forrest: To me the process of creating music is more like painting. It's something I prefer to do in private, as a form of personal release with focus and minimum distraction. Not quite a meditation, but close. I experience "flow" when the various elements of a piece suddenly "come together" to such an extent that I can sense what the rest of the piece should sound like. From that point forward, I'm in a race against time to record the remaining parts of the piece before I lose that sense of flow. It's much like remembering a dream when you wake up and scrambling to get the details of that dream on paper before they vanish. STAR'S END: Your excellent 2017 release Following the Ether Sun finds you continuing the path of the innovative artist. Were there any certain conditions in your life which contributed to the atmosphere of this album? Forrest: Two close family members passed away over the past two years, so the sense of making my life count has been fresh in my mind. I am also acutely aware of the current endangered state of the compact disc, given the music industry's shift to streaming. I hope my recent releases help make the case for preserving music in a physical format.